Ideal neighborhood pub where everyone knows your name and the menu tantalizes with seasonal options. 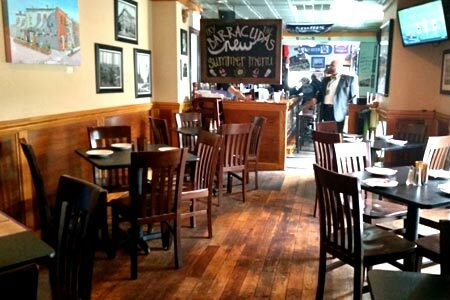 About the restaurant: Barracudas is more than the corner pub. Pull up a seat at the bar or sit at one of the tables in the back, on the second floor or situated al fresco just outside this row house home. Food & Drinks: Chef-owner Billy Hughes’ daily specials shine as brightly as the menu’s regular selections, such as his grandmother Adelina’s linguini and Maryland blue crabs, garlic, onion and tomato herb sauce, and the Saul’s Sandwich, named after his grandfather, with prosciutto, red onion, mozzarella, basil and an oven-roasted-tomato aïoli. The restaurant’s relationship with a local crabber will put the best and biggest soft shell crabs on your plate, and if you are lucky, the crab cake po’ boy will be the special of the day. Grab one of the seasonal Barracudas Crushes (peach, watermelon or strawberry) and share an order of B’More Fries created with hand-cut potatoes, lump crab, sherry, jalapeño bacon pan gravy and Romano cheese. Desserts are house made, like bread pudding or rice pudding accented with fresh fruit. And finally, what is a pub if it doesn’t have brews on tap, cocktails and a decent collection of wines from around the world?